Now that Leila’s older (if two and a half can ever be considered old), she’s showing a certain amount of interest in my beauty bits. It’s only to be expected and I embrace it, I see it as something we can bond over and I always feel like I’d be a horrible hypocrite to exclude her from something that makes up a sizeable chunk of my life. Sure, I hold my breath when she goes near my most precious compacts but she loves to see the colours of everything and we have little swatch sessions. I let her pick out some of my colours most days, and she does a great job. We had a ‘pink’ day last week and this is what she chose. To her, we’re doing the best painting EVER and she loves making Mummy look more ‘colourful’ (I try not to use the word ‘pretty’ or ‘beautiful’ in assoc. with makeup). She’s never asked to put any on herself – though she does nag me to do her nails (she always chooses red) and I always let her choose a perfume to spritz on her wrist. Would you let a two year old choose your makeup?! Would you/Do you let your children share your fascination for makeup? I do! Chloe isn’t overly impressed, she’s had a couple of sets of play make up but she really isn’t keen of the feel of stuff on her face, not even face paints. She does however love having her nails done. I like to file them for her and make a big fuss and she does her “I’m a Laaaaady” voice and pretends to be at a salon. It’s great bonding time and she loves having colour on her nails but we don’t do that too often, mostly birthday parties and school holidays. PS You look nice, she did a good job! awww too cute. leila looks soooOOOOOO grown up! Leila chose well! This is such a fresh look and I love how the blush and the lipstick look absolutely lovely together <3. If I let the little girl who I look after choose my makeup I’d have blue eyeshadow and the barbiest pink lips she could find. Leila did a great job! She obviously takes after her Mummy. My eldest used to be interested in my make up when she was 2-3, and now she’s 10 of course she’s getting more interested in doing her own (just for fun at home after school of course, just eyeshadows and lipgloss, nothing serious). My younger one never cared for make up and my son isn’t interested either. The girls love nail polish and we’ve bought quite a few glittery ones from Claire, they lovehaving their nails done all colourful and glittery. Leila is welcome to do my makeup anytime she likes, you look lovely!! My daughter is 2 and 4 months and the mere sound of my makeup drawer opening sends her franticly running upstairs to “dip-dip” she loves tickling her face with my makeup brushes and enjoys looking at everything I have. But when it comes to nail varnish- that’s where her real fascination steps in! She goes crazy and lays them all out in a line reciting their colours and saying which are her favourite. Love the colours she picked for you!! And ahwww she looks adorable! ps) I think it’s great that you don’t use the word pretty or beautiful in association with makeup, really refreshing! Aw, she did a great job picking colours! I’d have thought any tow year old would instantly go for the brightest things they could see – hot pink lips and lime eyeshadow, perhaps?! It’s great that you’re not associating make-up with beauty around her, too. A family friend used to come around with her daughter, who was Leila’s age. Sometimes I’d give her a clear gloss to play with and put some shimmery eyeshadow on her – she loved it! Holy crap your skin looks amazing! Your wee one is a makeup artist in the making. I also wear Make Up For Ever F&B in #38 but haven’t pulled it out in a while. I think it’s time. I wish I had a little girl to share my beauty secrets with. My mother was ultra feminine, but she wore only lipstick, so her “vanity” (such as it was) was not a lot of fun for me–especially since our skin tones are different (she’s warm and my skin is uber cool), so her Revlon Moondrops Blase Apricot, made me look like death on a cracker. Leila is so cute! And she had chosen some great colors for you. Oh sweetness… I love her wee smile! Very good idea saying that makeup makes you look more colourful – I’ll remember that! My little girl isn’t overly interested, though sometimes she takes a fancy to it. And she says I look more pretty with makeup on, which I can’t argue with! My 5 yo daughter has shown a great interest in make-up for a while. She’s wore a bit of sparkly pink shadow at a family wedding and a bit of tinted lip balm a few times but that’s it. She’s so perfect as she is, no make-up needed. But she loves nail polish and wears it often. We’re also really careful to not use the words ‘pretty’ or ‘beautiful’ in terms of make-up. We often say ‘fancy’ instead. She’s beautiful barefaced so we don’t want her to think she needs make-up to be pretty. But I’m also honest enough to know that I feel more pretty when I’m wearing make-up. That’s why we do it after all! So one day, she’ll figure it out. But now I want her to feel pretty just in her own skin. Good for you that you’ve figured out a way to include her in this without instilling the idea that someone NEEDS makeup to look good. I love your description of it as “the best painting EVER”. I absolutely think of makeup in the same way I do for coloring books, except it’s MY FACE OMFG! Oops, salad fingers here zigged when she shoulda zagged. Aww, Leila looks lovely and if I had a little girl, I’d love the bonding time. Emmy is obsessed with my make-up. She loves swatching and was thrilled when her friends got her make-up for Xmas (me not so much) and she is allowed a little play but her most common use for my Bare Minerals brushes……. pretend dusting in her Sylvanian Houses, if she sneaks them past me that is! Aw this post is just lovely. 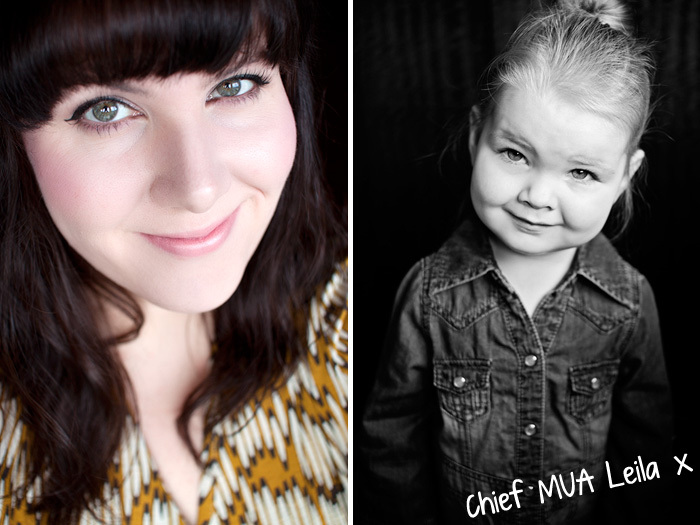 She made some great choices – I particularly like that her photo looks quite like an MUA show card, she’s adorable! That looks so pretty and yet natural, she has a great taste! She has great taste 😉 I also love that you say it makes you more colorful and not pretty/beautiful – I’ll remember that one too, for the future. I remember getting into my mother’s makeup (mostly lipstick – it went all over my face in the best patterns, ha!) so I feel if I have a daughter, it’s inevitable. Oh my gosh, this post is so great. Leila is completely adorable, and I’m so impressed with your approach to her and makeup. What a healthy way of talking about it! And I love that she rocks red nails––very classy! Awww this is SOOOO adorable! She did a GREAT job picking everything out too! I don’t have kids (yet), but I would probably not hide my obsession from them I used to play with my mother’s makeup which pissed her off, but in retrospect she could have easily avoided by giving me something cheap/she didn’t want anymore. This brought back memories of me doing my mother’s make-up as a very young child. I smeared talcum powder all over her face so she was a deathly pale, and drew on a moustache in mascara. You though, have not made the error of letting your little one actually *apply* the products! I think Leila will go far – great taste. My Little V is also 2 1/2. She adores looking through my “colors” – as she calls them I don’t actually let her wear makeup, but I occasionally run a big fluffy face brush over her cheeks, forehead, and nose for fun. I do let her wear “chapstip” but only uncolored Burt’s Bees. I worry I’ll give her a complex about needing makeup when she is older, but I try to remind myself that as long as she knows how beautiful she is as a person she can play around with makeup as much as she wants. Maybe tomorrow I’ll let her choose some colors for me…that sounds like so much fun! Gorgeous! Gorgeous! Gorgeous! Love that FOTD so feminine and pretty! Your daughter chose a nice colour for ya. bless her If I had daughters I would let them on occasion rummage through my collection and help me pick. My sons however have no interest but always compliment me on my eyeshadow. Haha, the benefit of hindsight always makes things somehow less OMFG!!! I always get a kick out of her cheeks. :)She’s adorable. That’s such a gorgeous picture of Leila! She looks so bright and just a teeny bit sceptical. She looks like such a character. What fun! Loving Leila’s choices. Very pretty. My nearly 3 yr old boy is a big make-up fan too. He always goes for the most expensive/ or favourite things in my make-up bag ( trolley). When I try and steer him towards cheaper items he points out we should be ‘sharing’. Hmm. She has good taste in makeup. My daughter used to love putting on make up when she was younger, especially eyeshadows and green eyeshadows on her own lids. Them she got fascinated by the little pearls called Guerlain Meteorites. 😉 Nowadays, she is 5 now, whenever we are going out shopping or on special occasions, she would always ask to use the Meteorites. She applies it all over her face! Putting perfume on a 2-year-old is borderline stupid. Perfume is not for children. It can harm them and cause horrible allergies. When she asks for a spritz of perfume (perhaps once a week), the spritz is 90% on the sleeve of her clothing. It’s winter, she’s living in long-sleeves. I expect a tiny amount from the spray lands on her hands but really, I prefer to dedicate my time focusing my parental concerns on things that are more likely to actually harm her.